This page is designed for those who seek information about Moldova, want to learn more about our country and eventually travel here. 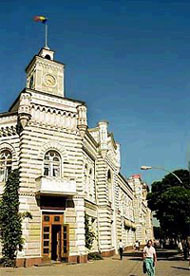 You will find lots of pictures and all kind of information about our country and its capital Kishinev. Tell me by e-mail what other information would you like to see on my page or sign my guestbook. Click here to take a look at the new website of West East Travel. Now you will be able to look through a picture database of apartments and houses for short term and long term rent in Chisinau and also other cities of Moldova. Have a look at the tours and excursions offered by West East. Click here to join the Moldova travel discussion group. You will find lots of useful information and share experiences about our country. We have launched a page on our site that will feature travel stories of people that traveled to Moldova and wished to express and share their experiences and thoughts with other people that consider visiting Moldova. Go to the travel stories page to see what they have to say.